As I head off this morning for my second BurlyCon experience, I leave you with this video that I’ve shared before (but I have a feeling you won’t mind too much). Timothy arrived in LaFitte, Louisiana in the fall of 1956 to begin filming Bayou. He had an unusual assignment from the film’s producers – he had to learn to “dance real wild.” In New Orleans he asked a cab driver to help him out. The cabbie took him straight to Leon Prima’s 500 Club in the French Quarter. A stunning, statuesque burlesque dancer by the name of Lilly Christine, billed as “The Cat Girl,” was performing there. Tim returned to the club every night for a week to watch her dance. I’m sure he needed little persuasion to conduct this kind of research. After all, it was for the good of the film, right? This is a beautiful gallery of stills accompanied by the awesome tune Song for Lilly Christine by the one and only Big Rude Jake. Posting will probably be sporadic for the next five days or so. Enjoy! Our pic today takes another look at Ulysses, the “confused teenage gorilla” of Bayou (1957), directed by Harold Daniels on location in LaFitte, Louisiana. 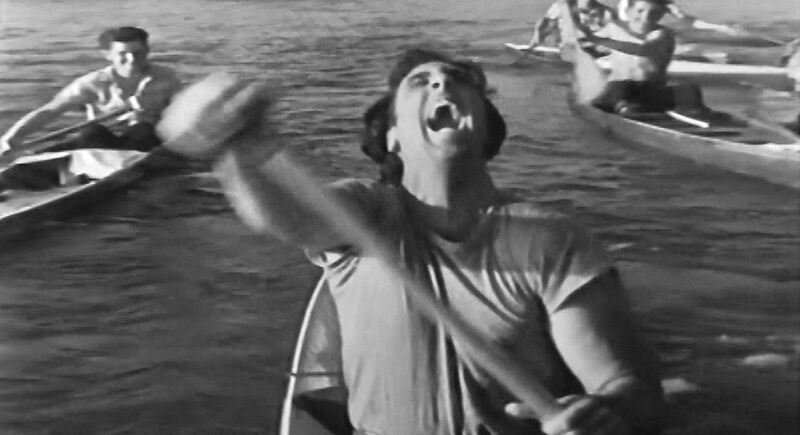 Here we see him giving his all during a kayak race with his hated rival, Martin Davis (Peter Graves). Watching Timothy having a crazy good time in a little tiny boat is wonderful, but watching the fellows in the background is even more fun. They are clearly enjoying the spectacle of this nutty guy from Hollywood going off the rails.